This season I’ve made several shirts that demand a second look. And a third look. With each look you’ll notice something new in the garment. 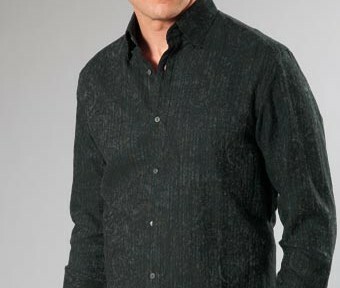 In each one, there are unique details in the textile or the design of the shirt that make it special. Sometimes, it’s good to bring people closer to you. These shirts do that. They’re intricately detailed in ways that draw people in. They don’t shout across the room, yet they make very powerful statements. Take, for example, Out of Line (available in Black or White). From across the room , these might seem like nicely tailored but somewhat plain shirts. But look closer and you can see the geometric pattern in the fabric. Take another look and you’ll likely notice the extraordinary cuff details: embroidery stitching and pleated cuffs. Another great example is Recital. Multicolored or space dyed yarns create a soft, swirling pattern. Look closer and you’ll notice the fly cuffs (where the button is hidden). Want to see more? Check out my Jhane Barnes Collection for Fall 2012. This entry was posted in Fashion/Style, Textiles and tagged Fall 2012, menswear, Textiles on September 18, 2012 by jhane.